"Indiscriminate seal killers" ... With this unjust accusation against the coastal fishermen - our allies since the initial stages of the marine conservation area Northern Sporades - the Hellenic Society for the Study and Protection of the Monk Seal (MOm) and their associates have demonstrated clearly their incompetence and regardless diffamation, actually the total failure of their strategy. 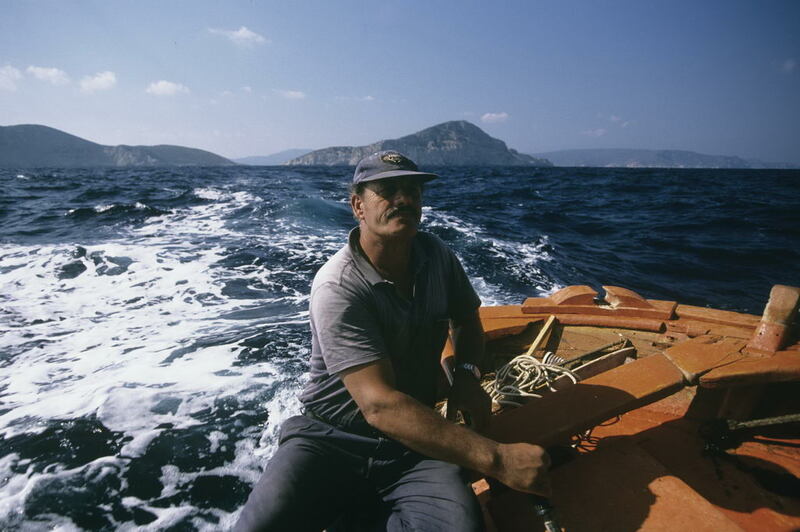 Because, at the time when MOm was founded, already there existed a full collaboration between the Cooperative of the Fishermen of Alonnisos and the conservation movement on behalf of the seals - see the "Declaration by the Fishermen of Alonnisos" of 1982 below. By this consensus the seals had become valued allies of the fishermen, in their function as guarantors for exclusive fishing rights in the coastal waters of the archipelago. A delicate alliance existed between the seal protection network on the one side, and the fishermen on the other. All the stakeholders were aware that the fishermen had regarded the seals from unrecorded early times as noxious animals destroying their nets and feeding on their catches. The more one should estimate the tremendous achievement that is documented in the Declaration. Monk seal protection - as I have emphasized elswehere - cannot succeed without an amicable, full collaboration with the coastal fishermen. Why are there no efforts made (as far as I know) to provide the Cooperative at Alonnisos with their own website so that the members can advertise rooms for rent and other facilities? Why is the Cooperative seen as unfit to take up the guarding in the marine park (after some professional traning)? Why is it still illegal to take tourists on board of fishing boats? These are aspects one has to consider in providing a safe future for the seals! The earlier achieved fruitful union beween the conservation movement and the fishermen of Alonnisos was gradually ruined by the MOm with their polities, over the 18 years since their involvement began. The exposure of a recent "epidemic of killings" threat may be seen even as presenting an opportunity on the side of the MOm to apply (again!) for funds from the European Commission. Since their establishment and invasion of Alonnisos, the MOm has collected "more than 6.7 million Euro", according to official sources, for their “services” in the park and the protection of the monk seal Monachus monachus in particular. Where are the results that justify that expenditure? An assessment or independent evaluation of the work of MOm has never happened. So how could the European Commission provide again generous funding (for LIFE), from European taxpayers money? States a supporter of MOm (email communication of 12 June, 2010): "...Investment. You mention 6.7 millions € in 18 years, amounting to less than 400,000 € per year, surmising that it is a large sum. I think that in relation to what is at stake, this is peanuts (think of what the US are spending to save the Hawaiian monk seal). 400k may seem a lot of money to a fisherman in Arki, but if you want to mobilise resources including expertise at the international level, it is very little indeed. I am sure that whatever was done could be done better (although when you do something you will invariably be criticised; to avoid criticism, you should do nothing but this is not a solution, is it? ), however I think Europe and Greece are still doing "too little, too late" in this Vietnam War against monk seal decline..."
The total amount entrusted to MOm, according to independent Greek researchers, exceeds 20 million Euro. That estimate considers also private donations, eg. by IFAW, possibly the Belrive Foundation and other NGO's. The violations of the legislation for Marine Park during the years 1998-2002 total up to 47. After looking carefully at the list of the violators of the law for the Marine Park (the list exists in Greek with a reference number of the authorities, full name and category of violation) we find that the violations by the local fishermen come up to 7 a mere 14,90 % . Only one (1) breach concerns approach to Piperi and fishing by “line hooks”, which is the most ecological and traditional way of fishing. The other breaches concern the method of fishing by “lobster cages” for which unfortunately there is still no clarification in the law, as to the conditions of their use. Those violations took place outside of Zone A. Violations of the law by non locals come up to 39 that is 83% (TABLE 2.). They concern mainly violations by “spear gun” fishing (18) a percentage of 38,3 % of the total number of violations (TABLE 1.). Those violation took place mainly at Piperi (core zone of the Marine Mark) (11), at Skantzoura (5) and Kyra Panagia (6). They were made,rather, by non professional fishermen but by people who approach the islands by speed boats from Thessaloniki and Volos. “Spear gun” fishing is one of the most catastrophic ways of fishing and as it is a hobby of people in opulence, it is very antagonistic to the income of the coastal fishermen. Another catastrophic way of fishing is the “Gri gri”fishing (4) which comes up to 8,5% of the total violations of the legislation of the Park (TABLE 1.). The local fishermen , despite their large number of boats and considering that the area of the Marine Park is the place of their professional activities they have a low percentage of breaches. Those violations, although they technically consist a breach of the law, they do not influence or damage the ecostystem. ( Many of fishing restrictions, as we have pointed out in the past, still remain unreasonable). Even the larger region of Piperi could be given to the local coastal traditional fishermen , for some methods of fishing, (e.g. line hooks) .It could well be that under an appropriate protection system the contribution and participation of the local fishermen in the guarding network of those remote areas could have positive results. In this way the catastrophic “spear gun” fishing and “Gri gri” fishing could really be reduced to nothing. Notice: Full list of the violators, the category of violation and the areas they took place, exists in Greek. The data elaborated have been transferred to the tables in the English version. These statistics illustrate a positive image of the local population (and of foreigners, but not of non-local Greek people) - the fishermen accordingly could have been employed as guardians without any doubt; there was no need for any payments to MOm as guardians in the park. The more if this organisation did a very sloppy job in surveillance and a high amount to breaches remained unnoticed (cf. remarks by Giannis Florous about Piperi in the last paragraph of this article). Sadly, the ones which know the park region for decades, being aware of the parks many natural and cultural monuments that now are inaccessible by order of park regulations, sadly this small community of those with a long term involvement have to fear that since the park was officially declared in 1992, the destruction or the decay accellerated instead of the natural and cultural assets being now effectively protected. All the millions of Euro, we have to assume, were totally waisted and there is no accessible evidence in the wilderness of the islands of any effective conservation measure! This scandalous scenario and the secretive cover up of the park's most vulnerable assets should be investigated thoroughly by independent experts as a matter of urgency. I wish to insert here a personal note: in my consciousness as the initiator of the Marine Park and as the trustful ally of the fishermen of Alonnisos for more than half a century, I feel responsible and obliged to raise my voice again and expose the derelict status of what only in official language is presented as the Marine Park. In many ways it had been a better solution for the magnificant landscape and the rare species of these Deserted Islands not to promote their "protection" and thus keeping out people which sensed the potential of getting access to otherwise not existing excessive funding by a generous European Commisssion and rather naively believing NGOs. The park is not only the most significant habitat for the last remaining Mediterranean monk seals in the Aegean realm. Threatened are to an alarming degree the other assets of this first conservation area in the Mediterranean Sea. Examples are the over-grazing on Kyra Panagia and on Gioura and the deterioration of the cultural monuments at several islands, on Piperi and on Skantzoura above all. The so called Rescue Station run by MOm is there for emergencies only. So one should be relieved if there are no seals, no pups being treated in that station. But what should the MOm then present to the public, to the many visitors which desire to see a seal, an appealing puppy … every single case of so called rescue of orphaned pups should be screened at location by an independent research team! Conservation fails where it operates in conflict with the local people. This fact was ignored by the MOm to an extent that now caused an eruption of protest. (cf. again The Monachus Guardian, June 2010, editorial: An epidemic of killings). The fishmen are capable of guarding the park and in return they should maintain their traditional fishing rights and benefit from eco-tourism operations. It should be the priority task of a responsible Ministry of Environment to implement this working relationship. The Ministry presents the Greek government and the European Commission DG XI that is supposed to safeguard the national and European heritage as well as the peoples vital interests. The increasing deterioration of the faith and good-will in these public institutions, by the local people , can be easily demonstrated by the example of the Marine Park Alonnisos Northern Sporades (cf. further articles to be published under the categories The Monk Seal Alliance and Northern Sporades marine conservation area ). - welcome the steps taken to preserve the natural environment and the rare fauna of their traditional fishing grounds, especially the monk seal (# 1). - agree also to assist the authorities concerned in patrolling this conservation area in order to implement legislation. - that their traditional industry is severely endangered by the modern exploitive fishing techniques of vessels which frequently enter their fishing grounds, especially the so called Gri-Gri tis Imeras boats (# 2), as well as by dynmite fishing frequently practized by resident individuals (# 3), and by spear fishing carried out by tourists and sponge divers (fungarades) (#4). - that protection of the monk seal population is only practicable if compensation is granted for the losses both of nets and catches destroyed by the seals. - that an annual compensation payment of approx. 20.000 DRCH is granted for each boat (# 7), or alternatively, that fishermen get a return of 50 % of the cost of new nets. Finally the fishermen agree that wildlife tourism is an additional source of income and they welcome any steps which enable the co-oerative to purchase a suitable cuising boat, eg. by provision of a low interest loan. # 1) The archipelago off Alonnisos (outer Northern Sporades) is considered as one of the most valuable wilderess areas in the Mediterranean, with almost no human habitation, well separated from populated areas. The 20 islands and the surrounding sea are of extraordinary natural beauty and habitat of a very strong colony of monk seals (Monachus monachus), and other rare species like Audouin's gull (Larus audouinii), Eleonora's falcon (Falco eleonorae), other are sea birds and plants. # 2) The Gri - Gri tis Imeras boats use very fine msh nets and catch equally baby fish. Catches per boat per day may exceed 15.000 kg. Since they operate in the area, the fish species marida (Maena chryselis) has vanished completely. # 3) Dynamite fishing currently is practized by two individually known persons using speed - boats. Authorities so far have not taken appropriate action to stop them. # 4) Spear fishing in the area by tourists is a very severe threat to the fish populations. Two species of fish - roufós (Epinephelus guaza) and sargós (Diplodus sargus) - have been largely exterminated by spear fishing. In summer, Italian "tourists" and other foreigners fish commercially using freezers, lamps and the (illegal) bottles for diving to spear fish. They maKe considerable profit. Some sell fish under price to Alonnisos restaurants. Sponge divers have turned to the much more profitable spear-fishing as well. They often use chloride to chase big fish out of their shelters in order to spear them easily. # 5) It is in fact a question of survival for the traditional fishing industry - which did not over - exploit the resources of the sea. Destruction of fish populations by large vessels which enter the area and sharply rising costs for nets, fuel etc. at the same time are the main factors. Today 1 kg of net costs 700 DRCH compared with 220 DRCH five years ago, while 1 kg of goppa (Bops bops) today returns only 150 DRCH compared with 70 DRCH five years ago. During the same time the price for fuel went up from 5 to 20 DRCH. Therefore the number of fishing boats (kaiki) using traditional techniques is decreasing evey year. There is no reason, however, to encourage a further decrease of boats out of conservation considerations. To the contrary, their presence in the conservation area guarantees the best possible control, provided their support is well maintained. # 6) Most of the local boats are equipped with VHF radio and wil report immeditately any violation of legislation. But then a speed boat is needed for the harbour master or his delegate to get to the spot as quickly as possible. A suitable craft is also needed to prosecute dynamite fishermen who use speed boats themselves, as well as for checking tourist crafts etc. # 7) At present, 43 boats are members of the cooperative. The total annual amount for compensation accordingly comes to 860.000 DRCH. Actually, the annual compensation was calculated at 55.000 DRCH. Taking into account the advantages gained by stopping Gri - Gri tis Imeras, dynamite fishing and spear - fishing in the area, the amount can be reduced to 20.000 DRCH. It is very important to totally prohibit within the proposed conservation area the three activities Gri - Gri, dynamite and spear - fishing completely and also to provide for the essential means to control legislation, in order to link up these privileges for the local fishermen with the protection of the monk sea and other rare fauna: because only as long as there are monk seals there, they will retain these privileges and as soon as there are no more seals left, the Gri - Gri will come back etc.. It is by that system of mutual advntages that a stable and long - term conservation constellation can be achieved. End of The Declaration by the Fishermen of Alonnisos (1982). Note: The reader might have noticed my personal reluctance to consider (re-)compensation payments as a recommendable solution to satisfy the local foshermen and to motivate them to protect the seals. Any such scheme implies the risk of conflicts. How can one trust a Greek government to honour its obligations and to guarantee a continuation of regular payments as agreed upon. Other indigenous fishermen in the Aegean or Ionian Seas may get yellous and a hatred attitute against the seals may arise - so payments in one region may spark off killings in other regions. On the other hand the actual damages by seals have to be compensated for, without any doubt - and the fishermen do expect this to happen. Certainly the monies received by MOm would have been more than sufficient to pay a carefully waged re-compensaton scheme for many years - until more stable and sustainable solutions evolve. The co-operative is still waiting for special rights to be granted. So far, only the prohibition for one year of the very destructive Gri-Gri boats has been implemented (1 November 1983 to 1 November 1984) on the basis of a new law (issued in March 1983) which allows such measures to be taken at the district level. This move is part of the present Government's policy to de-centralize power and give more weight to regional government. Fortunately, the regional fishing authorities in Volos for the entire Northern Sporades and Pelion areas are very conservation minded and support the establishment of the marine park, and other measures to protect the monk seal, and the implementation of the points listed in the Declaration by the Fishermen of Alonnisos. e) The permanent prohibition of all spear fishing in the waters of the proposed park and around Alonnisos. If the fishermen were determined to eradicate the entire seal population of their traditional fishing grounds, they could do so without any strict legislation and its enforcement being able to stop them. It would be impossible to control the fishing boats day and night, all th eyear through, in every single bay of this wide archipelago. This is also the case in other parts of the Mediterranean. Therefore it is essential for the survival of the monk seal, to convert the traditional enemies of the seal into active supporters. Any pressure upon the fishermen by legal and other means implies the great risk that they are going to do what they have not yet considered - to solve the problem on their behalf and kill off all the seals forever. - there existed a a bond of mutual personal confidence. b) Cash compensation for actual damages could only be an interim solution, because such payments would soon lose their iniial good effect and might not be available in the long term to the extent agreed upon. In the case of suchpayments being sgtopped, the situation might becme worse than it was before payments started. c) Very careful distribution of such compensation payments must be guaranteed so as not to upset individual fishermen. d) Actual damage caused by the seals is very difficult to assess. e) Demands over the years would gradually become higher and higher. Other groups of fishermen would try to get similar cash payments - otherwise their attitude towards the seals could become even worse than at present. - granting of exclusive commercial fishing rights and legal prohibition of activities which affect the traditional fishing industry (eg. spear fishing by tourists). g) All such privileges must, however, be related to the protection of the seals in such a way that the fishermen are made aware - not only in the initial stages - of the fact that these advantages depend on their active protection of the seals. f) In order to enforce the exclusive fishing rights, and in particular to control tourism and limit boats entering the conservation area etc., the authorities concerned must provide effective aids such as a harbour master's office and a speedy patrol boat. The fishermen would have no legal means to enforce the law but would be able to report violations - which they certainly would do, because it is in their own interest to do so. It is impossible to negotiate with single fishing boat crews. Therefore it was a great advantage that the fishermen of Alonnisos are organized into a very well managed co-operative, comprising at present 64 boats (kaiki) which is almost the entire fishing community. After the Fauna and Flora Society of London had assisted the co-operative in purchasing an ice-making machine (by a donation of 8.000 Pounds Sterling), most boats which had previouslystayed outside the co-operative now joined it, because the co-operative held the monopoly to distribute ice for a cheap price to its members. ... The strategy described in this chapter can be used as a model for other important monk seal habitats in Greece and for marine conservation areas in other countries of the European Community such as Italy and France. Even where the attitude of fishermen towards the monk seal is hostile, as in Corsica (Scandola), after an initial education and public awareness programme showing the results achieved in Greece, the long-term support of the fishermen in the area can probably be achieved if local conditions are adequately taken into consideration. The dramatic changes of attitude by the fishermen of Alonnisos since the initial events as presented above and in the two related articles "Northern Sporades conservation area" and "Northern Sporades conservation area - continued", are symptomatic for the failure of MOm's "strategy" if it was supposed to mean more than just amassing funds and polishing up their image. Protagonist Giannis Florous (cf. the letter to Mr. M. Yeroulanos of 23th December 1976, under "meetings" in the first of the two articles just mentioned ) over the decades since the initial stage of negotiations with the fishermen of Alonnisos, has turned from a full supporter and mediator to a definitely negative critic. He is now one voice with the majority of younger fishermen who oppose the proposals which their predecessors designed jointly with us and approved. And they are spreading the bad news about the conservationists all over the Aegean. So why? Because MOm and the responsible Ministry have not been capable nor willing to establish a relationship of participation and mutual trust. 14th June, 2003 - "All the fishermen are now against the Marine Park!" undated - We hear the fokades (=seal people = MOm) are getting lots of money... our money! 8th March, 2008 - Proposition by the fishermen to the communal authority of Alonnisos (Dimos Alonissou): every boat to receive 9.ooo Euro per year. 25th December, 2009 - Piperi is now less controlled than previously, because there is no guarding and there are no local fishermen permitted. Piperi in fact is unprotected. Seals are deserting the island and disappear because of the disturbances (evidence?). There was no increase in numbers since the conservation status was declared (evidence?). Note: We never had proposed to prohibit local fisheries (by Alonnisos fishermen) at Piperi, only for the seals breeding season between 1 August to 31 October! 1st May 2010 - "You have done great damage to the fishermen by your proposals!" Was'nt Giannis fully participating from the very beginning? Over the decades the whole scenario and even the memory about the early events ( e.g. donation of an ice - making machine from the Fauna and Flora Protection Society) were dishonoured throughout by the queue of "conservationists" which appeared on the scene once plenty of money was threwn about by the E.C., out of just one motivation: pure greed! So the fishermen have thrown overboard what could (still) become their prime asset - the seals.